have you seen all the yummy chicken and turkey sausages they have at the grocery stores now? so many different varieties like chicken/apple or italian herb. on my last shopping trip, i spied a package of habanero/green chile chicken sausage and it spurred this super easy, fresh dinner entree idea. first, slice the sausage links as well as half a red onion, half a red bell pepper and one jalepeno. then sautee them in a large skillet with a little drizzle of canola oil. while they cook, boil of pot of salted water and add a package of whole wheat penne pasta. cook the pasta as directed, drain and toss with a can of green chile enchilada sauce (available in the mexican food aisle). in a large colander, drain and rinse a can of black beans, a can of corn and a can of diced tomatoes and mix together. i only used about half the bean/corn/tomato mix and added it to the sausage skillet and tossed everything together. then plate your dish! i put some of the green chile pasta in a bowl, spooned on some of the sausage/veggie mix and then topped it all with some chopped cilantro and a sprinkle of grated cheese. in all, it took less than 30 min to make and it was delicious! when i slow down and take it all in, it’s the everyday things that mean the most. like afternoon coffee runs with my favorite little person. she babbles and entertains me in the backseat. and i can’t help but smile at those polka dot tights. i’ve been slacking again. honestly i really haven’t felt like writing in some time and taking pictures hasn’t been a priority lately. sorry. things have been up and down around our house. claire is still on the diet, still having seizures. don’t get me wrong, we have seen major improvements. there are many times she wakes up and doesn’t have them, but sometimes she still does and they can be pretty strong ones. she also has stopped tremoring periodically in her right arm and doing little “jolts” like she used to. she learned how to babble about 2 weeks ago and talks to us every day morning and night! she is also trying to sit on her own, she likes to try and i am very confident that someday she will get the hang of it. she has been super smiley especially in the mornings, which of course makes my day. overall, we are happy with the small changes we have seen and plan to stick to the diet. the doctor reccomended increasing her medicine to see if the combo of it with the idet will work better. so we increased in a few days ago and are hoping we see more improvements. she likes to tell us when she is sleepy. so sweet. and get ready here are LOTS of pics of just being cute. to catch you all up on the last month. she likes making funny faces. the following are pics adrian snapped of us having a girl talk. until her paci falls out. family pic at schnepf farms festival. halloween night. she was a claire bear. and wanted none of it. she was not happy with us. and did not get to trick or treat. because she screamed instead. bummer. at least one vender girl enjoyed her costume. that’s it for now! congratulations on making it through this looong post! i’ll try to add the pictures to flickr soon so they link up and you can print them if you want! i love misty michelle photography. seriously people. she is the best ever. do you read her blog? if you don’t then i am so mad at you right now. it is eye candy yumminess every day. her pictures make me smile, make me get teary, make me think, make me appreciate the beauty in this world. go! go right now and devour every post! awhile ago, we received the final pictures that she took at claire’s first birthday party. i have been bugging adrian to help me embed them here but he is so busy, so instead you’ll just have to follow this link to see the slideshow. they’re amazing, huh? i can’t wait to get big prints and hang them all over my house (if you want any, there is a shopping cart icon on the bottom right). and i can’t wait to do a family session with misty in the future. especially now that claire is off the sleepy medicine and so much more awake. hope you enjoy the pictures and misty’s blog! 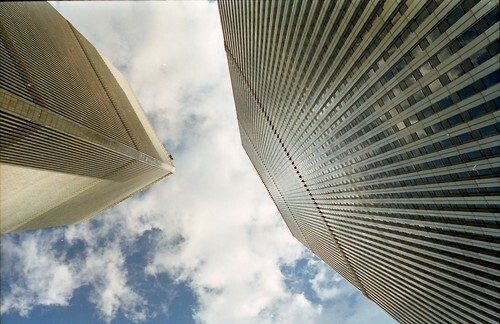 i found this beautiful shot of the world trade center twin towers on flickr today. eight years ago, i woke up to the news blasting though my normal top 40 radio alarm. confused as to why the news was playing, i turned on my tv only to see that tower one had been hit. i then watched as the second plane hit and the towers fell. at the time, i was a senior at ASU and called my parents, who were living in chicago, immediately. all i wanted to do was to go home, hug my mom and feel safe again. 2970 innocent people lost their lives during this unbelievable attack. and they were people just like me who started that day off as if it was any other normal day. i want to live every day i have to its fullest, embrace it all, be truly present- because i never know when it might be my last. more on SD vacay 2009 later.